Rhythm Heaven Megamix was released in 2016 for the Nintendo 3DS. Developed by the team behind WarioWare, the simple-button playstyle has you hitting A, B, or the D-Pad to hit to the beat of the music. Nintendo release the first game in the series, Rhythm Tengoku, for the GBA in 2006. However, Nintendo never released the title outside of Japan. The following two titles, Rhythm Heaven (DS) and Rhythm Heaven Fever (Wii), were the first handheld and console releases, respectively. Gaining a niche fanbase, it became Nintendo’s primary Japanese rhythm title series. How does Rhythm Heaven play? If you’re familiar with WarioWare, you may be familiar with the simple, A-button type controls. Hit A or the D-Pad to make a simple movement, using precise timing, and you’ve cleared the game. In Rhythm Heaven, you’ll be hitting the A-button to the beat of a song. This will include changes in tempo, changes in beat, and occasionally the use of the D-Pad or the B-button. The tasks involve anything from pulling the hairs off of onions to slicing fruit up as a Dog Ninja. Rhythm Heaven’s trademark is its quirky, cute visuals. A colorful game with simple character designs, some of which are quite odd. They can be of any race, species, a vegetable, or even concrete. Every part of these games have characters trying to accomplish a goal. The player will find sub-stories to these games. The Remix stages help to narrate these stories by putting them altogether, sometimes with color or texture differences, and even an ending. These stages revisit all stages in a column, and sometimes it develops into its own story shown through the actions and the endings. What’s in store for Rhythm Heaven Megamix? Nintendo released Rhythm Heaven Megamix on the Nintendo eShop in 2016. For whatever reason, there was no retail release for the game. However, rest assured, it is a full-fledged title worth the price tag of $30 on the Nintendo eShop. There are well over 100 games to play, and many of them are remakes of past titles. For instance, Karate Man, Lockstep, and Ringside return from the GBA, DS, and Wii releases, respectively. 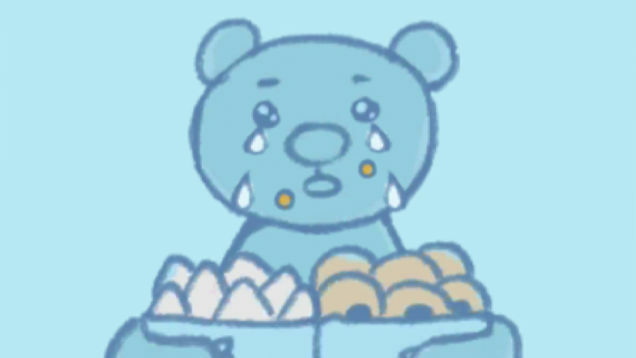 Megamix comes full of new hits, such as Fruit Basket, LumBEARjack, Blue Bear, and Pajama Party. The overall concepts are the same for these games, and a number of them are quite challenging. As with previous titles, expect to see them return later in the game, harder than ever. It’s a welcoming challenge for newcomers and veteran players, slowly adjusting the player to the curve. Remember not to eat your feelings. Is there more to the game? Megamix offers up to four players to compete in multiplayer. One player can host the game, while the other three join via Download Play – no added software required. Every minigame is playable, and it offers new challenges for these players. On its own, Megamix is in the upper echelons of 3DS multiplayer titles, and is great for gatherings of any kind. Plus, there are multiple single-player challenges. You can get the Star in each game, as well as get a Gold Medal to unlock more content. You can even feed a goat! Unlocking content includes little items you can buy to decorate your room. Moreover, you can unlock a number of past games from the Rhythm Heaven series, as well as “infinite” challenges for certain games, such as Charging Chicken, among others. Overall, there will be hours upon hours of content to unlock once you beat the game, which you can do at your leisure. If you’re a fan of rhythm games, own a 3DS, and love catchy music, which ranges from many, many genres – all of which is catchy – then I strongly recommend digging up this gem. It’s an honest 9/10 in my book and would be worth anyone’s 3DS collection! Nintendo’s releases on the 3DS have been noteworthy since the launch of the title. While many, such as Fire Emblem, Zelda, Metroid, and Pokemon have been prolific, others have been known by less. If you’re interested in checking out more of Nintendo’s releases, check out this guide on Mario & Luigi: Superstar Saga + Bowser’s Minions. It includes the new “Minion Quest” mode, a tactical spin-off that adds a whole new story! A Look at Bowser’s Minions for the 3DS.